Southern senior Jane Roush (center) passes the ball in between teammates Kassie Barton (left) and Phoenix Cleland (6), during the Lady Tornadoes’ sectional semifinal loss to South Webster on Monday in Racine, Ohio. Southern senior Paige VanMeter hits the ball over the net during the Lady Tornadoes’ setback to South Webster on Monday in Racine, Ohio. RACINE, Ohio — Momentum matters most in the postseason. 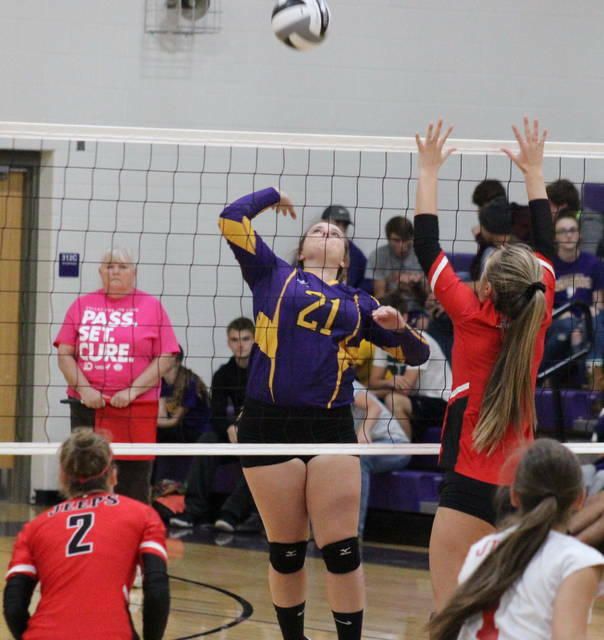 The eighth-seeded Southern volleyball had its 2017 season come to an end in the Division IV sectional semifinal on Monday night in Meigs County, falling in straight games to ninth-seeded South Webster, which has now won seven of its last eight matches. The Lady Jeeps (11-14) scored the first four points of the evening, but Southern (6-17) — which finishes the year on a seven-match skid — scored the next five points and took its first lead. SWHS tied the game four times before finally regaining the advantage with a 5-0 run. Southern cut South Webster’s Game 1 lead back to one point at 13-12, but then the guests extended their advantage to a game-high seven points at 20-13. SHS pulled within four points, but ultimately dropped the opening game by a 25-20 count. The Lady Tornadoes claimed the opening point of the Game 2, but recorded just one more service point over the remainder game. The Lady Jeeps earned 20 service points in the second game alone, winning it by a 25-6 count to move ahead 2-0 in the match. After a quartet of lead changes in the third game, Southern opened up a five-point, 16-11, lead. However, South Webster had a side-out percentage of 100 from that point on, fighting back to tie the game at 20. From there, the Lady Jeeps recorded five straight service points to take the match-sealing 25-20 victory. For the match, Southern finished with a side-out percentage of 33.8, while the Lady Jeeps finished with a side-out percentage of 55.3. 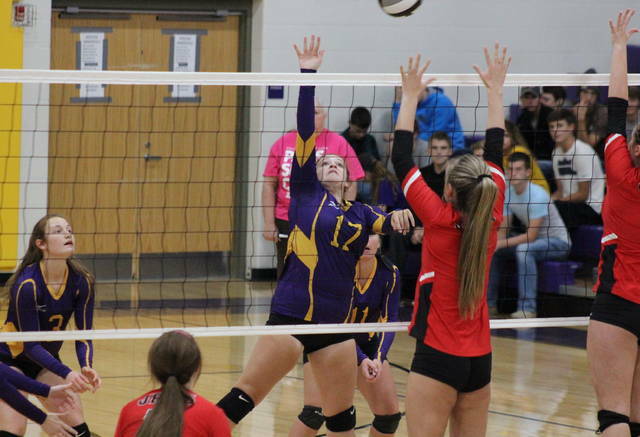 The Lady Tornadoes marked 49 digs as a team, while recording one serving error and 15 hitting errors. 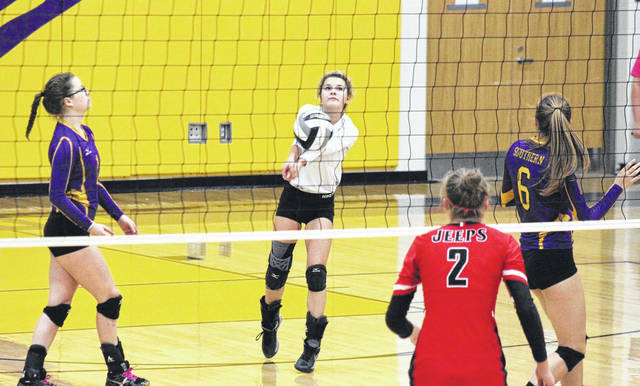 SHS libero Jane Roush led the SHS service attack with seven points, followed by Jaiden Roberts and Baylee Grueser with five points each, including an ace apiece. Marissa Brooker finished with three service points for the Purple and Gold, while Phoenix Cleland added one. The Lady Tornado net attack was led by Baylee Wolfe with five kills. Phoenix Cleland had one kill and one block for the hosts, Marissa Brooker added one kill and a team-best eight assists, while Sydney Cleland and Jolisha Ervin chipped in with a kill apiece. 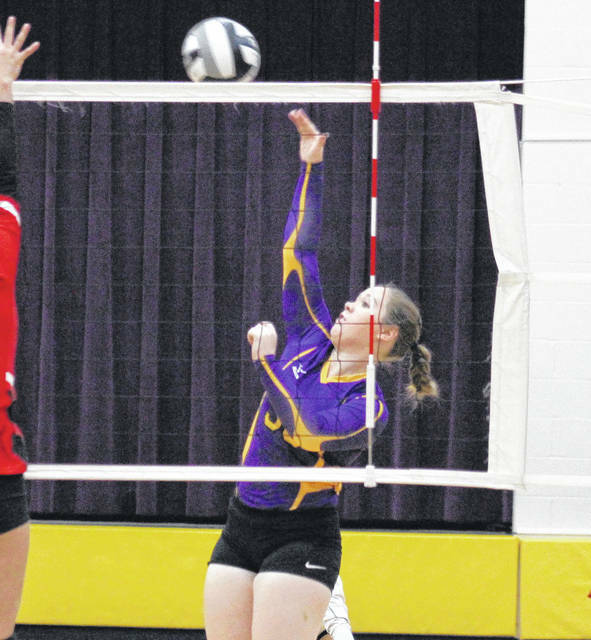 Abby Cummins contributed one block to the SHS cause, while Wolfe and Roush led the defense with 11 digs apiece. South Webster moves on to the Division IV sectional final on Thursday at top-seeded Waterford. This is the final game in the Purple and Gold for seniors Jane Roush, Jaiden Roberts, Jolisha Ervin, Sydney Cleland, Paige VanMeter, Julia Montgomery and Shelbi Dailey. The Lady Tornadoes were also winless in the 2015 postseason, but won sectional titles in both 2014 and 2016. This is the first postseason meeting between SHS and the Lady Jeeps in over 16 years.